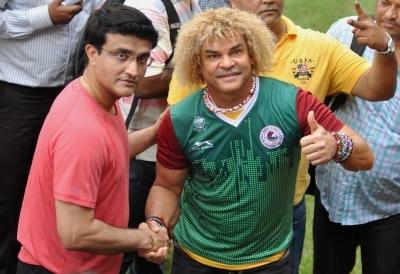 His familiar frizzy blonde hairdo intact, Colombia football legend Carlos Valderrama on Friday enthralled the packed crowd at the Mohun Bagan club ground wearing their hallowed green and maroon jersey and also signing a No.10 shirt specially designed for him. In the city to promote Diego Maradona’s ‘Match for Unity’ involving former India cricket captain Sourav Ganguly on October 2, the 56-year old midfielder was the cynosure of all eyes when he entered the ground sporting a moustache and an array of beads and bangles which was most endearing. Valderrama, who captained the Colombia team at the 1990, 1994 and 1998 World Cups, then signed a Mohun Bagan jersey which had No.10 on it and posed for the posse of waiting photographers. “We will preserve the jersey he signed. It’s a huge honour for us to host a legend like him,” Mohun Bagan finance secretary Debasish Dutta said later. Valderrama then took to the greens where the Mohun Bagan players were rehearsing for their next Calcutta Football League (CFL) game and juggled the ball a number of times much to the awe of the footballers and spectators alike. The twice South American Footballer of the Year (1987, 1993) then took a penalty amidst fanfare with Bagan goalkeeper Shilton Paul standing under the bar. He later met Ganguly at the Eden Gardens and spent sometime with him. “He enjoyed the crowd at the Mohun Bagan club ground a lot. He knew about Mohun Bagan’s existence was very happy to see the players playing when he arrived,” Satadru Dutta, partner in the firm promoting Maradona’s trip, said. “He (Valderrama) wanted to meet the Chief Minister badly. 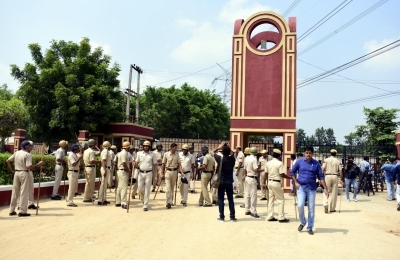 We are trying to organise a meeting,” Dutta added. Valderrama was part of the FIFA legends team which played in a charity match in Navi Mumbai earlier this week alongwith Fernando Morientes, Marcel Desailly, Jorge Campos and Emmanuel Amuneke. Valderrama, known for his passing, technical skills and elegance on the ball, made 111 international appearances for Colombia, scoring 11 goals.